Create eye-catching schemes with white paving blocks from the Marshalls collection. For a light traffic paving option, Myriad is available in a wide selection of plan sizes and gauges, for the creation of a variety of patterns. White block paving can be mixed and matched with alternative tones to create a look that’s unique to your project. For areas susceptible to surface water, Priora permeable white block paving provides a source-control SuDS solution, removes surface water and improves water quality, without the need for additional drainage systems. Cast with interlocking nibs to enhance surface stability, you can achieve a wide variety of patterns using the 200x100 blocks. 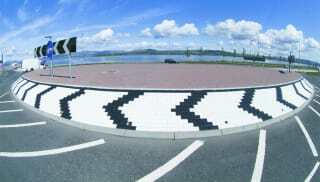 For areas where road markings are required as part of the paving scheme, use white block paving marker blocks. Durable and slip resistant, concrete markers in the Marshalls collection are suitable for permanent markings on parking bays, crossings and roundabouts. Explore our full range of white block paving now.